Thailand's Justice Minister Paiboon Koomchaya has said martial law will remain in place "indefinitely", amid mounting protests of military rule. His remarks to Reuters come a day after PM Prayuth Chan-ocha told reporters that martial law was "necessary" to stop "conflict and social disparity". The Thai military took over government on 22 May, and has been criticised for its repression of anti-coup protests. Several protesters have been arrested in recent weeks. A number of them have used a three-finger salute inspired by the Hollywood series The Hunger Games, which has been widely adopted as an anti-coup symbol. A cinema chain in Thailand cancelled screenings of the latest film in the franchise this week, saying it wanted to avoid trouble. In the films and books the gesture originally signals gratitude or admiration, but is later turned into a sign of silent dissent against an authoritarian regime. It has become widely used in Thailand by those protesting against the 22 May military coup. Some protesters have said it also stands for the French revolution ideals of liberty, equality and fraternity. In June, Thai authorities warned they would arrest anyone in a large group who gave the salute and refused to lower their arm when ordered. Prime Minister Prayuth Chan-ocha, who led the coup, has warned that anyone flashing it could "jeopardise their futures". 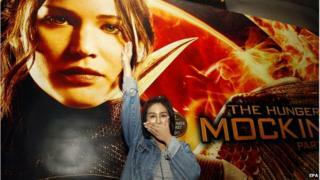 Hunger Games director Francis Lawrence has expressed concern that Thai youths are being arrested for using the salute. In an interview with Reuters news agency on Friday, Gen Paiboon said martial law could not be lifted "because the government and junta need it as the army's tool". "We are not saying that martial law will stay in place for 50 years, no, this is not it. We just ask that it remain in place for now, indefinitely." Gen Paiboon denied that the army was abusing the law, saying it "does not violate anyone's rights". On Thursday, Gen Prayuth told local media Thailand still needed martial laws. "Am I happy? No, I'm not. The longer [martial law] is in place, the more unhappy I become. Yet, it's necessary," he said. "Today, priority must be given to the future of the country. Conflict and social disparity must be stopped." The military has argued that by overthrowing the elected government they brought peace and stability to Thailand after an intense and violent political deadlock. Their move was welcomed by many Thais. It has promised to restore democracy and hold elections in late 2015. But international players have voiced concern that the military is consolidating power in the meantime. Human rights groups say that repression and censorship has intensified under the military regime. On Thursday, young activist Nacha Kong-udom was arrested outside a Bangkok shopping centre for flashing the three-finger salute in front of a poster for the latest Hunger Games film, Mockingjay. Two students who reportedly helped to organise a free screening of the movie were also detained. Five university students were arrested earlier this week for flashing the salute. Wearing T-shirts protesting against the coup, the students had flashed the salute at Gen Prayuth at an event in the northeast region of Khon Kaen. They were held overnight at a military camp before they were released unconditionally without charge on Thursday, local media reported. Gen Prayuth told reporters on Friday he was "unconcerned" about the popularity of the salute. Asked if it was banned, he warned: "I don't know whether it is illegal or not but it could jeopardise their futures." Matilda Bogner, a spokeswoman from the UN Human Rights Office for South East Asia, told AFP news agency that the arrests illustrate "a worrying pattern of human rights violations, which has the effect of suppressing critical and independent voices". The director of Mockingjay, Francis Lawrence, has also expressed concern, telling Buzzfeed News: "My goal is not for kids to be out there doing things that are getting them arrested."